Ecore International Products | Mason-Dallas Inc.
Mason-Dallas is proud to help ecore make an intentional global impact, providing technologically-advanced, creative solutions that eliminate wastefulness, by offering it’s fine products. 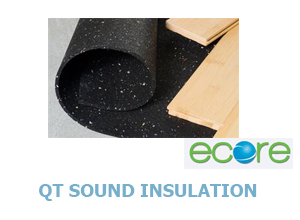 QT Sound Insulation is a patented line of high quality sound control underlayments made from 92% recycled rubber and tested in over 200 laboratory and field test assemblies. QT underlayment has been proven to repeatedly perform as engineered to meet design requirements. The product and engineering support that is provided guarantees that QT will work as specified, every time.